Free 24 hours airport shuttle, free trip to beach, free continental breakfast, free dinner buffet, free champagne, free cake, free wireless internet, free coffee, tea and cookies, free all you can can popcorn, rental car service. Heated pool. Book tours from the lobby, one and half miles from los angeles international airport. 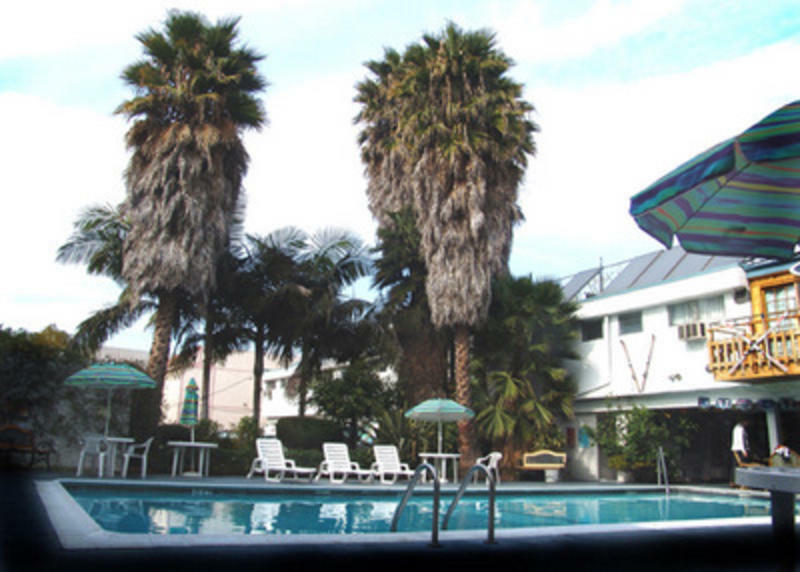 The adventurer hostel invites you to share a great and enjoyable visit to los angeles with the lowest room rates in town. Our bunk beds accommodate backpackers from around the world for great fun, meet friendly people from around the planet for experience you'll never forget. 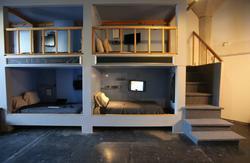 For further privacy our bunk beds are situated as male, female or mixed with the view of the pool or wilderness. For added security safe deposit boxes and lockers are also available. Our one bedroom cottages are set in beautiful wooded environment with the quietness of the wilderness and privacy. Our shuttle service provide our guest with 24 hour free shuttle service to and from los angeles airport upon request. Also to playa del rey beach for fun in the sun. Our shuttle service also provides free pick-up from metro transit bus center. Come meet our friendly staff at the lobby for your check-in. Ask our friendly staff to book tours for you, such as tours to sea world, san diego zoo, see los angeles city , hollywood and movies star's homes, universal tour, j paul getty museum, disneyland, knott's berry farm, beach tour & shopping and more. After your tour take a dip in our heated pool for relaxation. Our staff will help you with car rental services right from our lobby, affordable daily, weekly and monthly rates. To fit your budget. International drivers are welcome, under age drivers and cash rentals are ok. Our car rental service will pick you up from our lobby and drop you off right in our lobby. Our staff will also help you with laundry and dry cleaning services from the lobby or just use our in house laundry . Feel free to use our conveniently located atm machine in the lobby. Use our user friendly internet kiosk for your convenience or use your laptop using our free internet wi-fi. Listen to your favorite music on our juke box while relaxing by the pool or in the bar. Play videos game by the cool atmosphere of the pool and snack on chips, cookies and sodas from our vending machines and munch on free freshly popped popcorn or just get a soothing massage on our comfortable massaging chair. Start your day with our free hot continental breakfast consisting of a freshly baked blueberry muffin and hot tea or coffee from 7a.m. To 10:30a.m. Our in house full restaurant caters to your breakfast needs with daily breakfast and dinner specials. Also serving great variety of dinners including top sirloin steaks, seafood , appetizers, salads, sandwiches, hamburgers, vegetarian feast and delicious deserts. We have great menu selections for your dinner experience. Try our exotic seafood menu such as hawaiian mahi-mahi, filet of sole almondine, grilled scallops and halibut and our famous shrimp scampi. Our friendly restaurant staff also extends their service to room service where you can order anything on the menu without leaving your room. Furthermore, come join us in the afternoon for free freshly baked right out of the oven hot cookies with hot coffee or hot tea. From 3p.m. To 4p.m. Then from 6:30pm to 7pm la adventurer hotel invites you to all you can eat free hot food buffet with freshly baked cake. Relax in our full bar after a long day of fun and join us for a free champagne party from 6pm to 7pm. Our comforting bar also serves $1.99 beer on tap, wine, hot dogs, pizzas, ice cream and $2.99 margaritas. Try our famous tropical specialty drinks such as mai tai, singapore sling, pink lady, bloody mary, pina colada, hurricane shake and much more enjoying your favorite music on the juke box until 12:30 a.m.
Come make your visit to los angeles a comfortable and memorable one at the adventurer hostel. 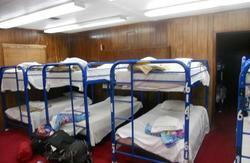 Please be informed that our dorms only accommodate students and backpackers. Also they must be between the ages of 18 and 30 and have valid and current passport. If your client has children under 18 accompanying them they must book a private room. Children are strictly not allowed in the dorms. 1 Minute to nearest Bus Stop. 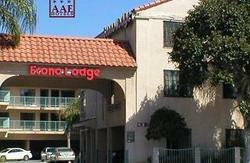 10 Minutes to Los Angeles International Airport. 5 Minutes to Metro Transit Center Bus. 30 Minutes to Venice Beach. 30 Minutes to Manhattan Beach.